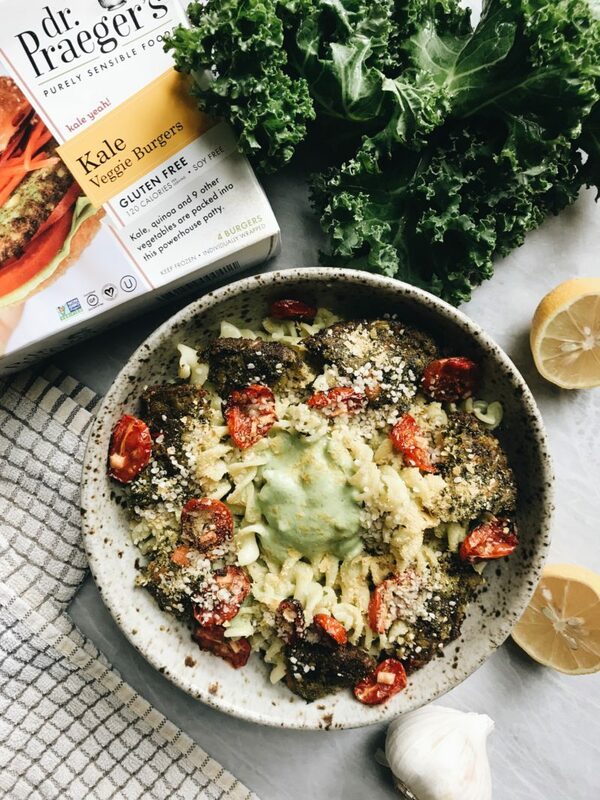 Enjoy this delicious creamy kale-basil pesto topped with a Dr. Praeger’s kale veggie burger & roasted tomatoes. I am pesto obsessed! I love to concoct different pesto recipes in my blender on the regular. It can be extremely fun to experiment with different ingredients and figure out what combo you love. 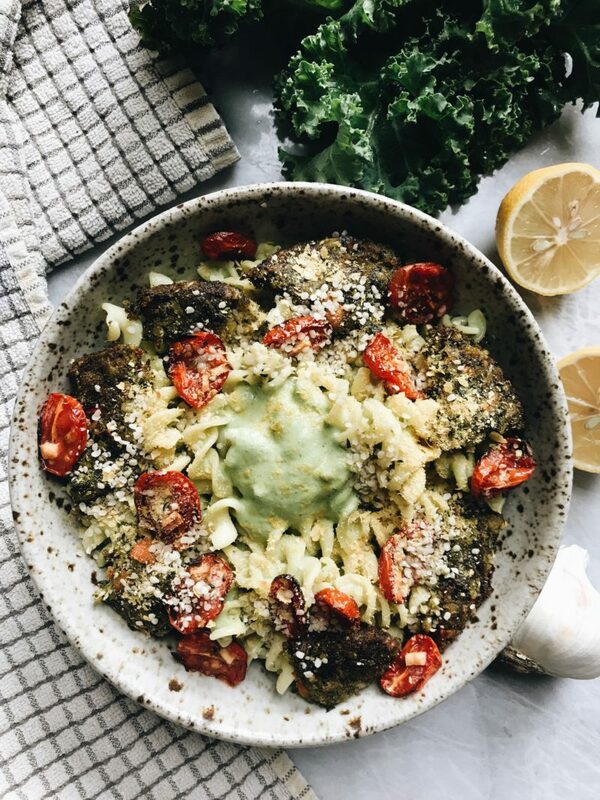 I love a traditional kale pesto, but I decided to put a spin on it by adding in some vegan cream cheese to make it super rich and creamy. 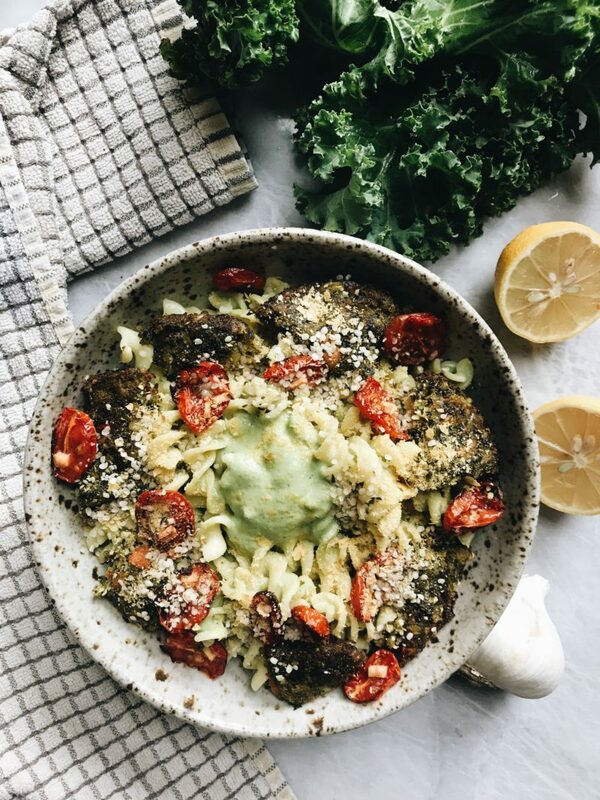 I went for a kale-pesto combo today to compliment the key topping in this recipe – a Dr. Praeger’s Kale Veggie Burger. I love Dr. Praeger’s. 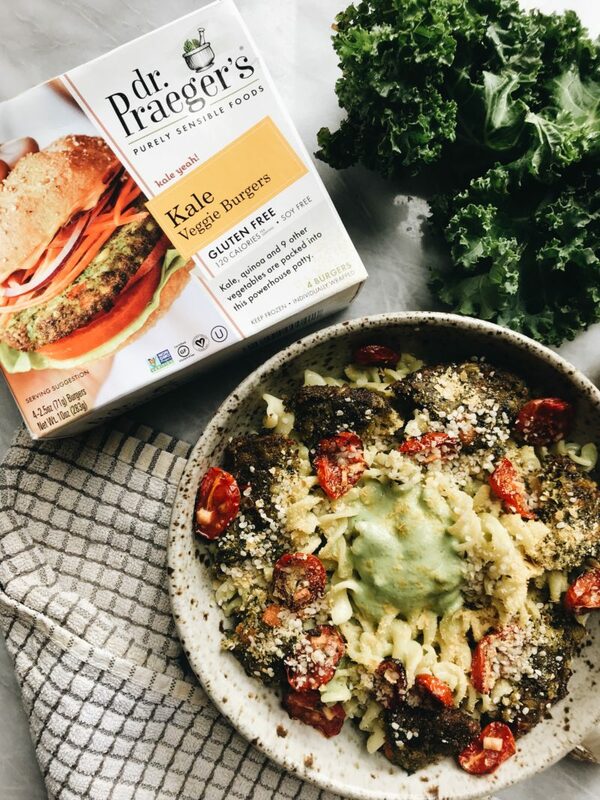 Whether it comes to their veggie burgers, hash browns, puffs or brussels sprouts cakes, Dr Praeger’s has all the vegan options. I also think a great way to get in extra veggies or protein is to add a veggie burger to your pasta dish. 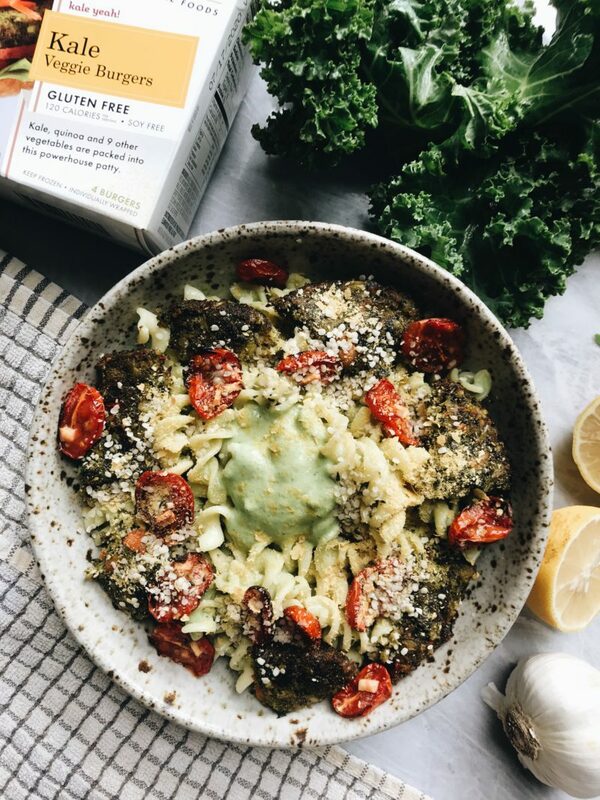 The Kale Veggie Burgers have 10 different veggies in it keeping it packed with vitamins and is the perfect addition to add to your pasta. I also added some roasted tomatoes to the dish as well. The heartiness of the burger really pairs well with the creaminess from the sauce. The pesto is of course nut free and the vegan cream cheese I used is soy based. I hope that you enjoy this recipe! If you make any of my recipes, don’t forget to tag me on instagram! Pre-heat your oven to 450 degrees Fahrenheit. Bring a large pot of salted water to a boil, cook your pasta according to package instructions. Once the oven is pre-heated, add your veggie burgers and sliced cherry tomatoes to a baking sheet. To prepare your tomatoes, cut in half lengthwise and add to a bowl with your 1 tablespoon olive oil, crushed garlic, salt & pepper. Cook veggie burgers for 7 minutes, flip and cook for an additional 5 minutes. Cook tomatoes for the same amount of time. Once your veggie burgers are done, let cool for a few minutes then cut into bite sized pieces. Set aside. Add all your pesto ingredients into a blender or food processor, blend until combined. Once pasta is cooked, drain and bring back to the pan. Add your pesto into the pasta and mix on a low heat until well combined. To serve, add your pasta to 4 different bowls and top with your tomatoes and veggie burgers. Thank you to Dr. Praeger’s for sponsoring this post. It means a lot to me to work with brands I love and who support my blog!